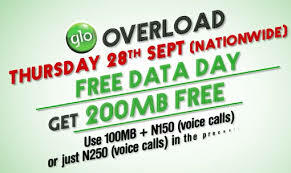 Glo has officially announced Thursday 28th of September as the second FREE DATA DAY this year, after holding the first on 11th of August which came up with a lot of reactions. The FREE DATA DAY follows the same approach as the last one. All Glo customers can enjoy this offer for a whole day. There is NO OPT In, NO Subscription. Use N250 or more on vioce calls.